Holy Baptism is the basis of the whole Christian life, the gateway to life in the Spirit (vitae spiritualis ianua), and the door which gives access to the other sacraments. Through Baptism we are freed from sin and reborn as sons of God; we become members of Christ, are incorporated into the Church and made sharers in her mission: “Baptism is the sacrament of regeneration through water in the word. (CCC 1213). If you like to have your child baptised, please complete the baptism application form which can be obtained by downloading it here, or contacting the parish office. Confession, also called the Sacrament of Penance, or Reconciliation. It is called the sacrament of confession, since the disclosure or confession of sins to a priest is an essential element of this sacrament. In a profound sense it is also a “confession” – acknowledgment and praise – of the holiness of God and of his mercy toward sinful man. It is called the sacrament of Reconciliation, because it imparts to the sinner the live of God who reconciles: “Be reconciled to God.” He who lives by God’s merciful love is ready to respond to the Lord’s call: “Go; first be reconciled to your brother.” ( 1424, Catechism of the Catholic Church). This Sacrament is offered throughout the week in this parish. Please see the newsletter to confirm times and locations. The regular slots are on Thursday evenings, from 7.00-8.00pm at Holy Rood, Saturday mornings, from 9.30-10.00am, at Holy Rood, and Saturday evenings, 6.10-6.30pm, Our Lady of the Rosary. You can also talk to a priest before or after Mass, or make an appointment, in person or via the parish office. Baptism, the Eucharist, and the sacrament of Confirmation together constitute the “sacraments of Christian initiation,” whose unity must be safeguarded (1285, Catechism of the Catholic Church). Confirmation, like Baptism, imprints a spiritual mark or indelible character on the Christian’s soul; for this reason one can receive this sacrament only once in one’s life (1317, Catechism of the Catholic Church). In our parish, Confirmation for young people (those of secondary school age) takes place every other year, and the Sacrament is administered at the Cathedral, the mother church of our diocese. The next Confirmation programme will begin in the autumn term of 2019, for Confirmations in Summer 2020. Adults who have been baptised as Catholics but who, for whatever reason, have not received the Sacrament of Confirmation, should speak to the Parish Priest. If you would like to get married at one of the churches in our parish, or if you live in the parish and would like to get married somewhere else, you will need to contact the parish priest well in advance of the proposed date of your wedding. In order to help you both on the journey of this wonderful calling, all couples will need to participate in marriage preparation. Organising this, and the other administrative and pastoral aspects of getting ready for your wedding, is the responsibility of the Catholic parish in which you are resident. So, whatever your situation, please contact Fr Daniel or the Parish Office to help you on the way. 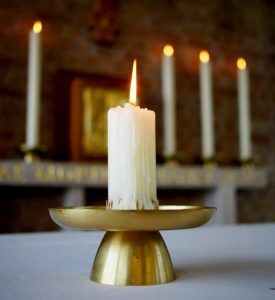 Men who feel that God is calling them to serve him as a deacon or priest in his Church are invited to arrange an informal meeting with the Parish Priest, who will explain the discernment process, and offer assistance with any questions. Those who begin to be in danger of death from sickness or old age should receive this Sacrament. It’s also fitting for those about to undergo a serious operation. This Sacrament may be administered in church, at home, in hospital, and so on. In the case of someone who is in danger of death through serious illness and the like, please contact the Parish Priest or parish office and try to arrange this as soon as you can. This involves a whole set of Sacraments! There may be Baptism (for those who haven’t been baptised), Confession/Reconciliation (for those who have been baptised), Confirmation, and Holy Communion. Adults who are interested in becoming Catholics should speak to the Parish Priest at their earliest convenience.